Here is the finished cake for my friend's birthday. She is hosting a lunch party today for the "coffee morning girls" and I will give it to her then! The topper is the one from the previous photograph. Lemon madeira with lemon buttercream and fondant icing. 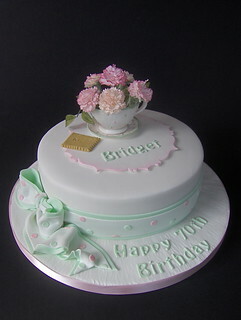 Coffee cup, biscuit and carnations all hand made in sugarpaste and mexican paste.